Much is talked about emerging computer languages and lately I have spent time trying two of these tools, Scala and Clojure. I find these two languages very useful for several applications and I like each for different reasons and attempt to keep current with related blogs and information items. Unfortunately, there are insufficient spare milliseconds in a day available for reading, exploring and applying these emerging computing utensils. Among the promises of these new programming tools is a better way to express an algorithm and capabilities to tap computing concurrency on multi-CPU computing platforms. 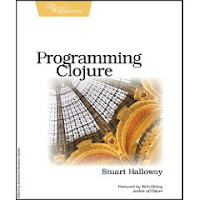 Should you be interested in Clojure, IBM's DeveloperWorks has a good and informative article on the concurrency features of Clojure; DeveloperWorks also includes this introduction to the language. As mentioned earlier, the most popular programming languages offer some very basic concurrency features: threads and locks. For example, Java 5 and 6 introduced numerous new utility APIs for concurrency, but most of these were either utilities built on threads and locks, such as thread pools and various types of locks; or they were data structures with better concurrency/performance characteristics. There was no change to the fundamentals of how to design concurrent programs. You still have to solve the same puzzles, and the solutions are just as brittle. You just have less boilerplate code to write. Clojure is fundamentally different in all respects. It does not give you the usual primitives, threads and locks. Instead you get entirely different concurrent programming models that include no mention of threads or locks. Notice the use of the word models—plural. Clojure has four different concurrency models. Each one of these models can be considered an abstraction on top of threads and locks. Let's take a look at each of these concurrency models, starting with the simplest one: vars.